Quantitative Aptitude is an inevitable section which is asked in government exams like SSC CGL, SSC CHSL, SSC MTS, SSC CPO, CDS, Banking and also in state level exam, so taking Quantitative Aptitude for granted can make you lose grandeur opportunity while desiring for a govt job. At the same time, there are countless number of aspirants who are phobic to Mathematics in general which is a sheer inanity as this section is ineluctable to appear in almost every govt job. 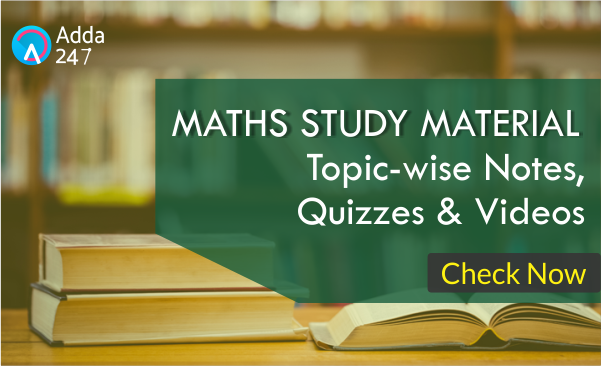 We are providing important notes, tricks, questions of Quant so that you can prepare well for all exams and perform as a winner. Below is the collection of important notes to understand the concepts to the root of various cardinal chapters, videos facilitated with brilliant faculty elucidating matter in details and presentable way and Quizzes to check your own skill and note down the mistakes to be meticulous in real exam.